SodaStream is iconic and has been enjoyed by generations. Many new features and changes have been made to models released over the years and pricing has fluctuated greatly. But it looks like SodaStream have hit a new high with the release of this beautiful, ultra simple to use model, with a sparklingly affordable price of $80-$99 in the USA and £64.99 in the UK. The SodaStream Source is designed by the highly acclaimed designer Yves Behar. The premium SodaStream Crystal we reviewed a while ago had an attractive up-market design, but hid away the bottle and carbonation process, whereas the Source has everything on display in a very modern outfit. Its blocky shape, swift lines and harmonious design definitely help the Source become a modernist countertop affair. The Source compliments simplistic modern kitchens and office spaces, but doesn't look outrageously out of place in older styled kitchens. Yves Behar has put great attention into where and how the materials are used on the Source's exterior body. Brushed metal wraps the rear main body, but cheaper plastic body variants are available too. We have the brushed metal red (also available in white, blue and black) colour and the combination of the two look gorgeous, during the day the sun allows the metal to gleam and shimmer and in the evening under indoor lighting it takes a darker sleeker tone. 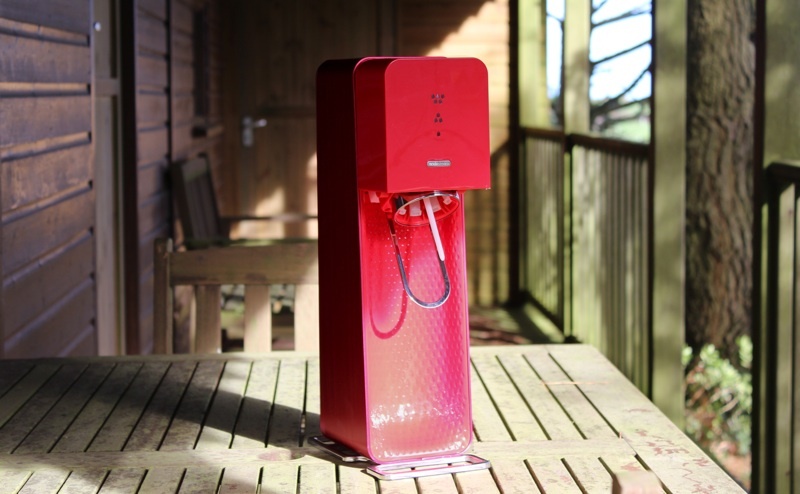 It's no doubt the best visually designed SodaStream to ever be released! But the Source isn't just visually pleasing, it's functionally pleasing too. An overhanging metal base with rubber grip keeps the Source fixed to its resting surface in operation. The one litre plastic bottle with a reinforced aluminium base definitely feels sturdier than the plastic reinforced version we used with the SodaStream Fizz and it looks sleeker too. A fizz preserving cap does its job of keeping the fizz in; after three days of being used a few times a mild fizz remained intact. However, we have spotted that the USA and other territories around the world have a more rounded bottle, whereas in Europe the bottle is squarer. We favour the rounded shaped bottle, but EU regulation appear to restrict this, so we have the squarer version within the UK. Both shaped bottles conveniently snap-lock into the SodaStream Source when the bottle is pushed into the drinks maker without the need to screw them in. Removing the bottle is just as simple. This is a very nice timesaver and just makes using the SodaStream Source that bit more pleasant. To begin carbonating the water inside the bottle, push the front of the Source down. A LED lit indicator panel will display the level of carbonation in three levels. This is similar to the Fizz Chip which we tested in the SodaStream Fizz, but is easier to see in dim lighting and is integrated into the machine in a far more clean fashion. Knowing the level of carbonation is informative and allows the user to tailor their fizz to their liking. We favour three bars of fizz, that's the highest level, with most flavours, and two bars with select others. It's nice to add a subtle one bar fizz to enjoy carbonated water on its own sometimes too. To carbonate a bottle of still water to three bars of fizz takes roughly twenty seconds, very speedy! 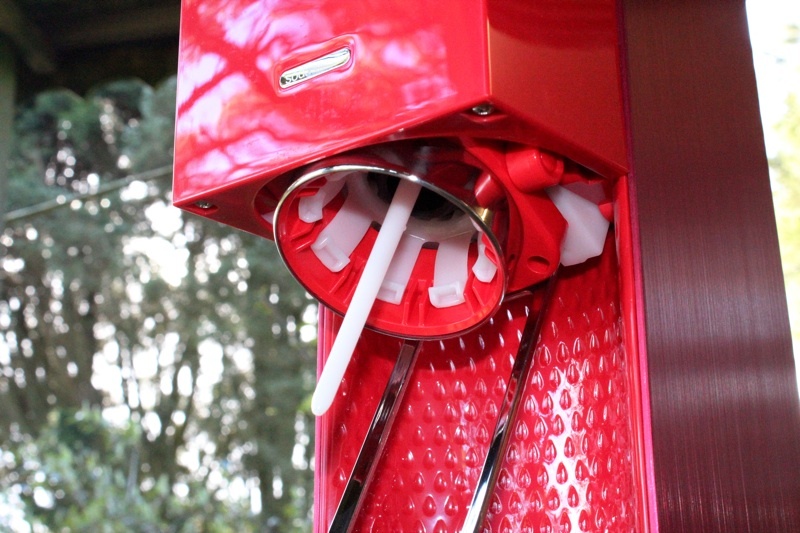 The CO2 carbonator bottle is rated to carbonate 60 litres of water and is screwed into the back of the Source, accessible via a removable door. The SodaStream Source includes nine SodaStream sample flavours in the box, all of which will make a litre of soda each. Flavours included are cola light, regular cola, cherry, lemonade, cream soda, pink grapefruit, ginger ale, tonic and Xstream energy. It's a nice way to try a wide selection of the flavours and understand how the SodaStream ecosystem works for first time owners. For this reason it makes the Source a more complete and immediate present for someone to receive. However, that's not to say that you have to use SodaStream flavours exclusively, cordials and other syrup based flavours will fizz nicely. In fact, we have lots of homemade elderflower cordial which we carbonate with the water made in the SodaStream Source on a regular basis and it tastes delicious! The flavour mix selection that SodaStream offer is increasingly growing, with over 62 flavours in the USA and over 50 within the UK (some of these are diet and sugar free variants of the same flavour). In the USA well known drink brands have partnered with SodaStream, these include Kool-Aid, Crystal Light and Ocean Spray. A new range that excites us is a selection of natural flavours made with stevia. We'd encourage SodaStream to roll out stevia into some of the more mainstream flavours, then they'd have huge nutritional advantages over the mainstream bottled off-the-shelve brands. Reassuringly all the SodaStream flavours we've ever tried are reminiscent of the flavours they're trying to imitate. In our eyes the drink that most soda lovers will be salivating for is cola, and the SodaStream regular version tastes and smells very close to Coca Cola. The prices of flavours aren't outrageous, when the math is done, and the SodaStream could pay for itself in the hands of heavy soda drinkers. Each flavour ranges from £3.49-£4.29 within the UK and $4.99-$6.99 within the USA. And generally a soda flavour mix bottle will make 12 litres which is 36 cans of drink. The SodaStream Source gets busy with the fizzy quicker than the other SodaStreams, thanks to the snap-on technology allowing the bottle to be quickly taken on and off the machine. Yves Behar's design is also a ravishing streamlined kitchen countertop appliance which you'll always want to have on display. Despite features like the LED carbonation indicators, snap-on technology and improved one litre bottle, the Source is actually cheaper than some of the less equipped models, with the price of $80-$99 in the USA and £64.99 in the UK on Amazon for the all plastic variant.